I'm a packaging snob when it comes to expensive items. If I'm paying top dollar for something then you better bet it comes packaged all pretty to me. If not there's a pretty good chance I won't be reordering. 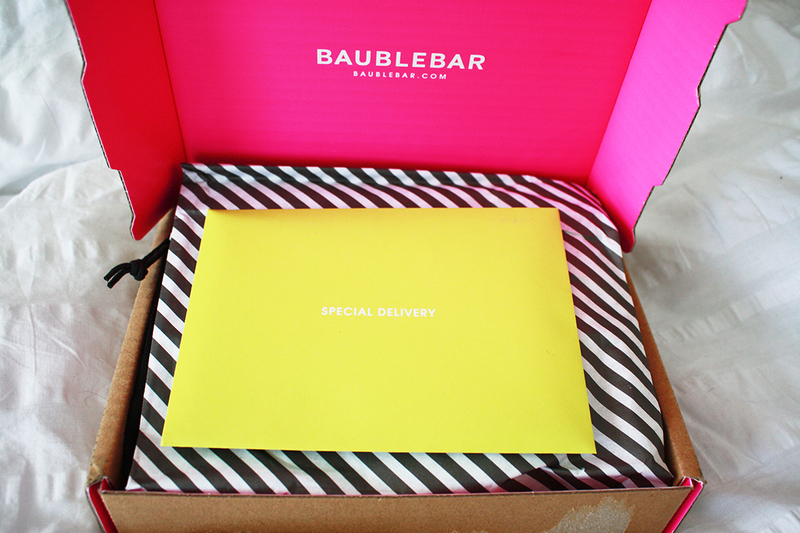 BaubleBar aced with flying colors the pretty packaging requirement! I mean look how adorable it is?! It's hot pink, striped with a fun pop of yellow! I love that it comes with a pretty storage pouch! I'm one who takes meticulous care of my things so this is great for me to store it in when I'm not wearing it! Even better is when you get a freebie with your purchase! I was so surprised and beyond excited to have gotten a BeautyBlender with my order. I've been wanting one forever and now I have one! There will be a review on it to come. 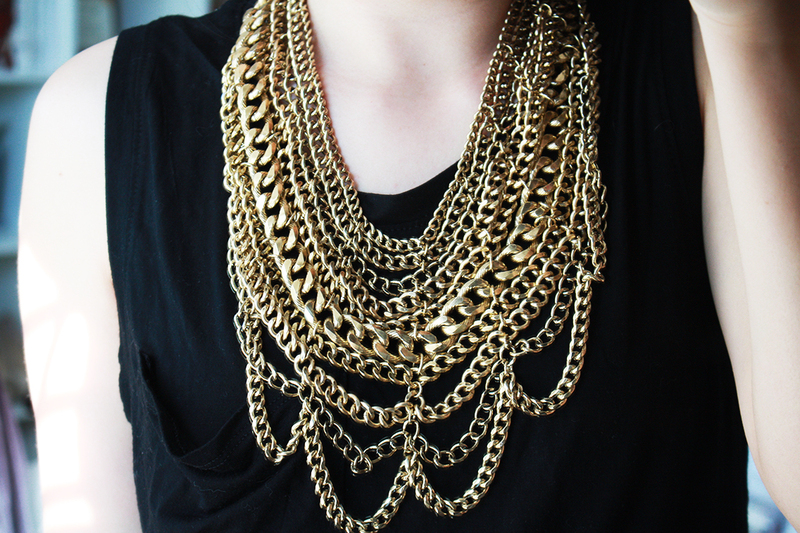 How absolutely gorgeous is this necklace?!?! I about died when I took it out and looked at it in person. 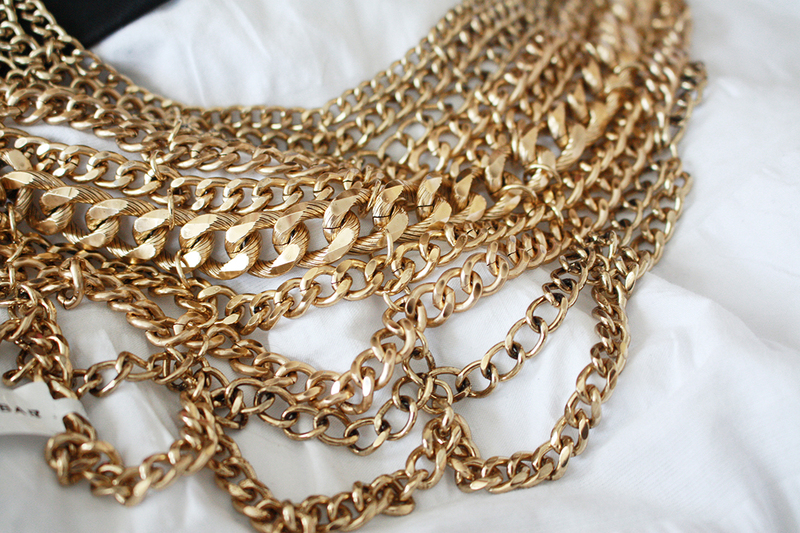 It's this beautiful gold metal that just looks like a million bucks. Excuse the mess. I've been unpacking and cleaning my room and doing school and working on blog posts! I was a little bit worried that it'd overwhelm me since I'm pretty petite (5'0"), but it doesn't at all! I love how edgy, glamorous and 'effortless' it gives an outfit. I was wearing jeans and a simple top and tried it on for grins and fell in love. It just adds this specialty to an outfit. You can wear it with a tee and jeans for a simple look or a dress and heels for something showstopping. An outfit post styling it will definitely be coming to the blog. I already have 3 outfits in mind! 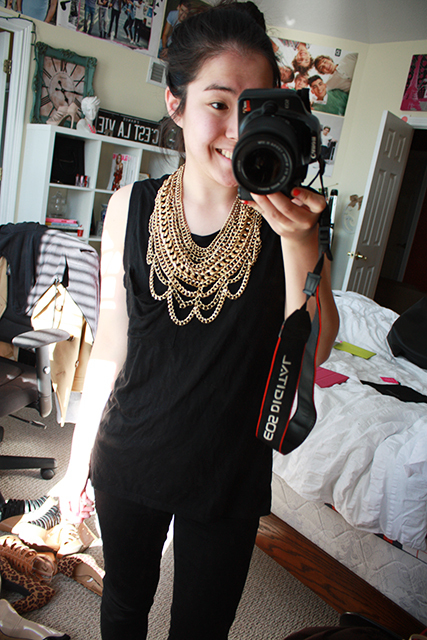 Obsessed doesn't even begin to describe the love I have for this necklace. It might be my all time new favorite piece of jewelry. Gah I love it! That's it for today's post! I'm back home and will be posting regularly now. I've got a lot of fun posts that will be coming so make sure you check back! What have you been lusting over on BaubleBar? Leave a comment sharing! "jewelry has the power to be this one little thing that can make you feel unique"
*Disclaimer: I am not affiliated with BaubleBar or Benefit in any way, shape or form. I am not getting compensated in any way for featuring this product. I bought the product shown with my own money.